Enter Mary Lou Tastad and Mike Kopp. 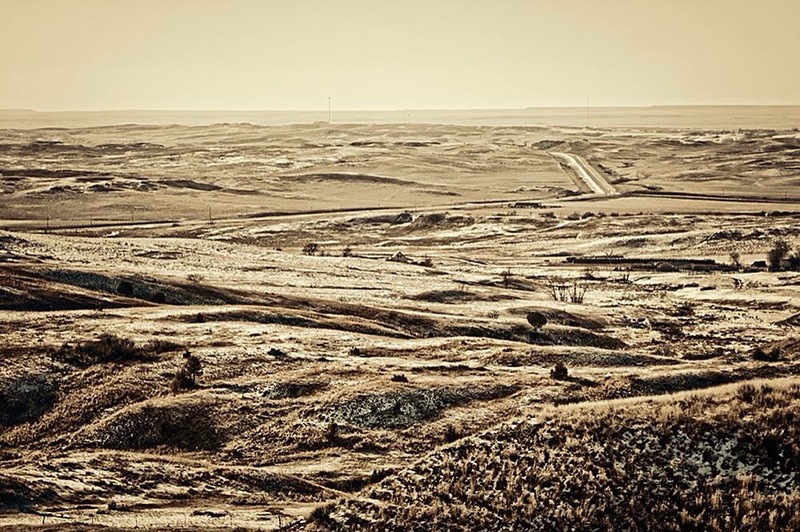 The pair have made it their mission to photograph and show the beautiful parts of the Bakken. And funny enough, two subjects that don’t seem to make much of an appearance in their photography are people and oil production. Thanksgiving weekend they held a reception and unveiled their collection at the Long X Museum here in Watford City. I wasn’t in town that weekend so missed the chance to meet them in person (bummer). Finally this morning I had a minute to myself and made my way over to check it out. I have now spent over a year exploring this countryside and living in it day to day. As I stood and looked at the images, the landscapes, old falling down structures in these big vast prairies, cool old automobiles left right where they broke down, and wildlife, the thought crossed my mind, is all of this really here? I have seen all of those sights as I’ve gone about my life in the last year but not like this. I haven’t seen them in that light, from that angle, with that much silence. Somehow Tastad and Kopp have seen past the beige and the mud and found gems, dotted all around the Bakken. When talking to Mary Lou she said to me, “Isn’t it amazing what beauty and history surrounds us, so much of which we miss in our busy lives.” She nailed it. Take this photograph for instance. The subject is the familiar beige and cold landscape I’ve looked at hundreds of times. But it makes me feel quiet, and pensive and almost makes me cry in a peaceful introspective kind of way. It just goes on forever. Not gonna lie, standing there looking at these images I felt a little sheepish. As I yearn for the mountains of Utah or the coastline of California it is a real shame not to stop and really take in the beauty of my very own neighborhood. I loved the quiet moment, taking in those photographs. Thank you Mary Lou and Mike for showing the beautiful, understated, sometimes overlooked angle of the Bakken. So, now your turn. The collection will be at the Long X Museum through January 8, 2016. It is free. Please stop in and enjoy the collection for yourself and buy a print if you’re so inclined. Prints range from $15-$30 with bigger framed and canvassed pieces in the $100-$300 range. You won’t be sorry. And as an added bonus, the collection is a part of the pioneer museum which I had also never explored before. Find out about the last lynching in North Dakota (McKenzie County’s claim to fame haha), see wedding dresses worn in Watford City in the dirty thirties, and enjoy artifacts of the area. This entry was posted in NoDak Livin, OIlfield People and tagged Beautiful Bakken, Long X Museum, Pioneer Museum, The Bakken's not so bad, Watford City by bebadoozie. Bookmark the permalink. Those photos remind me of western Oklahoma where I grew up. I thought it was ugly when I was young, but when I return I finally see the beauty in it again. I am sure there are days when those huge landscapes are spectacular.